DTE raises critical questions about the giant Tangguh natural gas and LNG project, operated by BP in Bintuni Bay, West Papua. Now in the production phase, this multi-billion dollar project has brought rapid and massive change to local communities whose customary lands have been used to site the project. DTE has questioned BP about human rights, social and environmental impacts and the wider political context and reports extensively about Tangguh. Communities have criticised the lack of transparency and unfulfilled promises at the giant Tangguh gas installation operated by UK-based energy multinational BP in Papua Barat. 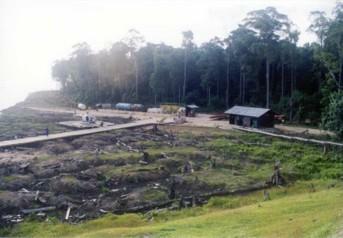 In February 2004, DTE took a detailed look at BP's controversial gas project in Bintuni Bay, West Papua. One year on, we ask how far concerns over human rights, security and local people's rights have been addressed. The Tangguh gas extraction and liquid natural gas (LNG) installation in the Bird's Head region of West Papua got the final go-ahead from BP on March 7th. As a result, the area will experience massive social, environmental and economic changes. The 'final investment decision' to proceed with Tangguh came on March 7th, after many delays. The construction phase of the US$5 billion project is now expected to start in late 2005. Tangguh will be operational in 2008, with two full gas production units or 'trains' (Reuters7/Mar/05, TIAP 2004). The Tangguh gas project: what hope for human rights protection in a worsening political climate? With the political context worsening and militarisation in West Papua increasing, BP's commitments to human rights and its 'community-based security policy'- look more and more flimsy. In 2003, West Papua continued to suffer the impacts of Indonesian military repression. Two studies commissioned by BP have highlighted serious concerns over the impact of the planned Tangguh gas project in West Papua. BP has announced the findings of two studies it commissioned to examine the potential impacts of the Tangguh gas project in Bintuni Bay, West Papua, on human rights, local communities and the environment.